I do a lot of traveling for work and while I absolutely love my job, the best part of travel is getting to try new burgers while hanging out with friends and family. I won’t lie, given the choice between 2 business destinations, I’ll chose based solely on a desire to eat somewhere. Such was the case on a recent trip to my hometown, Detroit. The Rockstar Energy Drink Mayhem Festival was making a stop at the DTE Center with 2 clients of my clients on the tour, Shadows Fall and Big Jay Oakerson, it sounded like a great excuse to go try out the Red Coat Tavern. 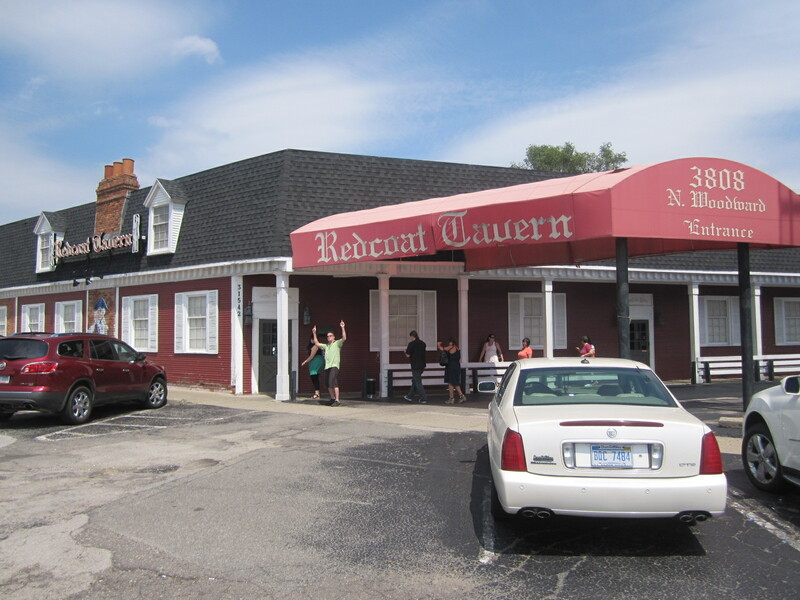 Located just North of downtown Detroit, in Royal Oak, MI, the Redcoat Tavern is known for serving up a burger that is extremely favored by locals. Located on the most major North / South bound road in Michigan, Woodward Ave, (if you watch the HBO series “Hung” its the street Thomas Jane is walking along in the intro) you can’t miss this large red brick building with it’s huge red awning hanging over the parking lot. Call ahead, up to one hour before you arrive, to get on the list. The restaurant is busy, busy, busy at all hours of the day and with the popularity of their signature burger, you’re bound to end up waiting for a table. The decor is simple; a dimly lit, red brick room with large wooden tables and booths, red leather booths, a fire place, a bar and right when you walk in the front door, a mannequin dressed as a Red Coat soldier. 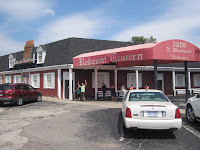 The Redcoat offers 2 kinds of burgers, their regular beef blend or the leaner and more healthier Piedmontese burger. While the burger is the reason for the seasoning, they also offer up other rare pub fare like Scotch Eggs, Cuban Sandwiches, Seafood Chowder and some of the best onion rings North of equator. If you’re a micro beer fan, you’re in luck, nearly the entire backside of their 1 page menu is a list of great beers. 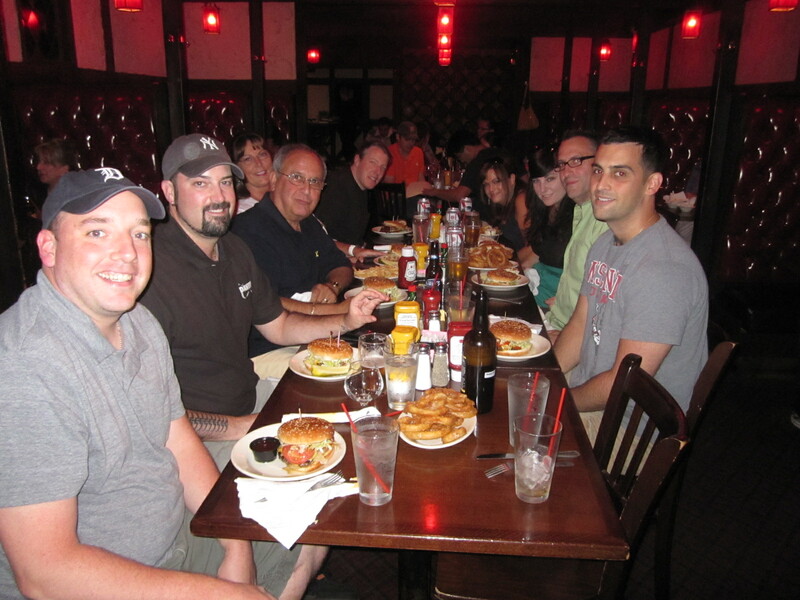 So with several of my friends and family members in tow, we descended upon the Redcoat for a proper Burger Conquest. The Redcoat menu offers a variety of burger toppings for you to create your own selection with but strongly recommends their signature burger with the option to add the sweet “zip sauce.” While it took me only a minute or two to select my burger, choosing a Beer was a much longer feat. While my Mom, Step-Father, brother, and Adam, Michele, Logg, Lynce and Chris gave their orders to the waitress, I perused the beer list until I landed on a Jolly Pumpkin Oro de Calabaza, a golden ale aged in oak barrels. 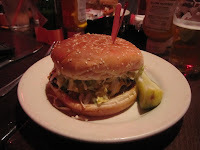 Without much wait, the burgers arrived on the table and everyone’s eyes started to light up. 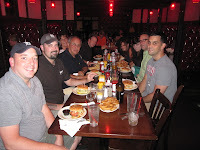 While my step-father, on his first ever Burger Conquest, laughed at my pre-dining photo taking, everyone else dug into their Burgers. 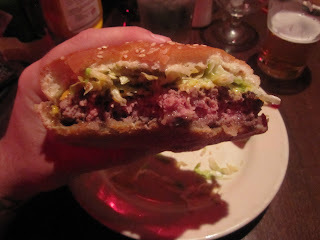 Served on a larger Sesame Seed Bun, the Redcoat Tavern is a really good classic American Burger. Made with quality ground Beef that is coarsely packed and topped with Cheddar, Lettuce and Special Sauce (essentially Mayo), hold the Tomato, this Burger is worth the hype. I wish I would’ve ordered the Mayo on the side as they put on way too much, which distracted your taste buds from tasting the delicious Beef. If you like Mayo, I would suggest getting in on the side and adding it, sparingly, yourself. I was impressed that even with a such a larger order that the Redcoat served my Burger a perfect medium rare. Big points for the accomplishment. 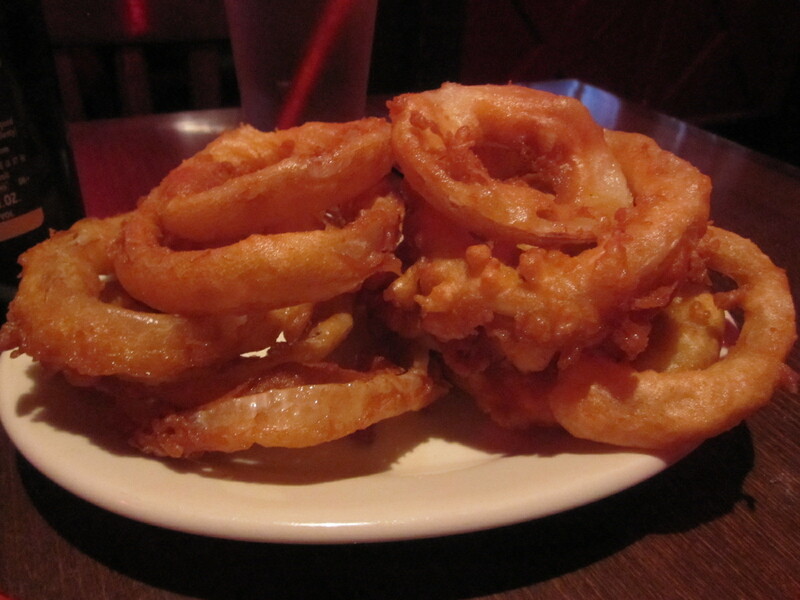 Skip the Fries, they aren’t anything special but do not miss out on the Onion rings. They are some of the crunchiest, greasiest and most tasty Onion Rings I have ever had. Had this Burger been the subject of Paul Revere’s advertising methods, the colonial settlers would’ve have had a totally different reaction! This entry was posted in Bar, Beer, Burgers, Gourmet Burgers, Hamburgers, Michigan and tagged best burger, burger conquest, cheese, ciancio, craft beer, detroit, french fries, hamburger, michigan, nyc, redcoat tavern, rev, review, royal oak, the great burger conquest cheese french fries detroit michigan mi redcoat tavern red coat royal oak review best, the rev meter for social community, zip sauce. Bookmark the permalink. Hands down…this is the best burger that I have ever come across here in Michigan!!! It's a firework explosion in your mouth!!! A Redcoat burger is so massive and delectable, that you usually end up taking half of it home to savor later. Please note: If you do have leftovers, take 'em home or put 'em on ice in a cooler if you're not headed to a fridge nearby. Believe me, you do not want to forego this mouth-watering indulgence during round two. Pingback: The Unvegan | The Redcoat Tavern is Coming!